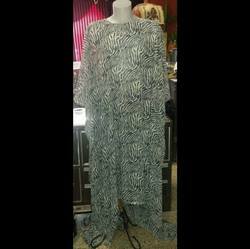 A beautiful floor length chiffon poncho with a variety of fashion styles. This poncho is made to your measurements and can be paired with a simple dress or tights underneath for a quick run to town or a more formal occasion. This piece can be made in 17 different solid colors, up to 60" wide. An all occasion gown, this gown is made of four way stretch to your measurements. It is available in over 200 colors and patterns. This gown is made to your measurements. The price given is for up to a size 22.